Ang pamumuno ng dating Pangulong Fidel V. Ramos, na kilala rin bilang Ramos Administration, ay tumagal sa loob ng anim na taon mula Hunyo 30, 1992 hanggang Hunyo 30, 1998. Sa panahon ng kanyang pamumuno sa kapangyarihan, si Fidel Ramos ay ang ikatlong pinakamatandang tao na sumunod kay Sergio Osmeña na maging Pangulo ng Pilipinas sa edad na 64 (naitala ni Pres. Rodrigo Duterte ang rekord na ito sa pagiging Pangulo sa edad na 71 noong Mayo 9, 2016). Siya rin ang unang Protestant President ng bansa at ang tanging Filipino officer sa kasaysayan na may hawak ng isang daang ranggo sa militar ng Pilipinas mula sa Second Lieutenant hanngang Commander-in-Chief. Nakakamangha ang mga nakamit ng dating Pangulong Fidel Ramos. Pero marami pa rin sa atin ang hindi pa nakakaalam sa mga lihim na kontrobersya at sandals ng dating Pangulo. Isa ang site na About Stuff ang nagsiwalat nito. “His criticism of Duterte's first 100 days has opened his own track record to scrutiny. As it turns out, he has a number of issues against him.” idinagdag pa ng site. The saying 'people who live in glass houses shouldn't throw stones' is very appropriate for former President Fidel V. Ramos who fired the first salvo against President Rody Duterte. His criticism of Duterte's first 100 days has opened his own track record to scrutiny. As it turns out, he has a number of issues against him. This is a very interesting read mostly taken from Wikipedia. Do your own research because there seems to be a lot more to be uncovered. Supposedly, one of his notable contributions to the Philippines was the revival of nationalistic spirit by embarking on a massive promotion campaign for the centennial of Philippine Independence celebrated on June 12, 1998. However, charges of alleged massive corruption or misuse of funds blemished the resulting programs and various projects, one of which was the Centennial Expo and Amphitheater at the former Clark Air Base in Angeles City, Pampanga, supposedly Ramos' pet project. The commemorative projects, particularly those undertaken at the former Clark Air Base, were hounded by illegal electioneering and corruption controversies even years after the Centennial celebrations. A special report by the Philippine Center for Investigative Journalism (PCIJ) showed how the projects relating to the Expo site not only revealed the extravagance and inefficiency of the administration, but also served as convenient vehicle to effect election fund-raising for the LAKAS political party of Ramos at the expense of the tax-paying Filipinos and in violation of the Election Code. The Centennial Expo Pilipino project, intended to be the centerpiece for the celebrations for the 100th anniversary of the country's independence from Spain, also earned extensive criticisms for being an expensive white elephant project that disadvantaged the government at the cost of P9 billion, or 1.7 percent of the country's 1998 national budget. Six ranking Ramos cabinet members and officials, headed by Chairman Salvador Laurel (former Vice-President) of the Centennial Commission were cleared by the Ombudsman and Sandigan Bayan (People's Court). Ramos appeared before a Congressional Committee in October 1998 to help exonerate said officials of any wrongdoing. 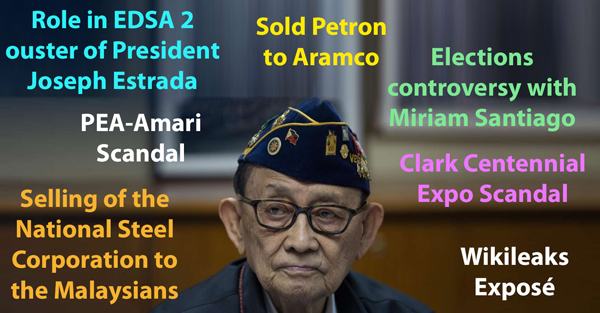 President Fidel Ramos was accused of corruption in the PEA-Amari deal. The controversial deal involved the acquisition of 158 hectares of reclaimed land on Manila Bay that was to be converted into so-called Freedom Islands. The deal was forged in April 1995 as part of the Ramos administration's Manila Bay Master Development Plan (MBMDP). The PEA-Amari deal – in addition to other projects in Manila Bay - displaced over 3,000 fishing and coastal families in Manila Bay just to give way to what fisherfolk activists from Pambansang Lakas ng Kilusang Mamamalakaya ng Pilipinas (Pamalakaya) described as "an immoral, illegal and grossly unconstitutional state venture". Ramos denied accusations that the PEA-Amari deal was clinched to benefit members of the ruling Lakas-NUCD as alleged by opposition groups. However, ex- solicitor general Franciso Chavez filed a petition to nullify the PEA-Amari deal because the government stood to lose billions of pesos in the sale of reclaimed lands to Amari. On April 25, 1995, PEA entered into a joint venture with Amari to develop Freedom Islands and on June 8 of the same year, Ramos okayed deal. On November 29, 1996, then-Senate President Ernesto Maceda delivered a privilege speech assailing the deal as the "grandmother of all scams". A longstanding criticism of Ramos was whether his role in the Estrada ouster was motivated by his fear of being prosecuted in connection with the Centennial Expo and other scams. Ramos heavily criticized Arroyo's decision. Estrada's son, Sen. Jinggoy Estrada, retaliated by asking Ramos to first "come clean" on the alleged multi-billion-peso anomalies involved in the PEA-AMARI, IPP and other deals negotiated during his term. This resulted to the loss of the government's effective leverage on domestic oil prices. Along with the deregulation of the entire oil industry, Petron's privatization is blamed for the continuing surge in oil prices that has particularly proved to be deleterious to the masses amidst the obtaining high petroleum costs in the global market. The National Steel Corporation was Philippine-owned and the biggest steel mill in Asia at that time. The steel mill was located in Iligan City. On August 30, 2011, Wikileaks exposed reports sent by the United States Embassy in Manila that contain detail that the Libyan government under Muammar Gaddafi allegedly contributed USD 20,000 to the presidential campaign of Ramos in 1992. The report said it was former House Speaker Jose de Venecia who brought Ramos to Gaddafi. Reports said that Ramos and De Venecia "had been engaged in shady dealings in both Libya and Iraq involving construction contracts for his firm, and had tried to "repay" his Libyan benefactors by acting as their front man and errand boy." The same report added that there was a lot of speculation when Ramos and De Venecia left for a secret trip abroad in middle of the 1992 campaign, and implied that this connection with the Libyan government was one of the objectives. Section 95 of the Philippines' Omnibus Election Code enumerates prohibited sources of political contributions and one of them is " Foreigners and foreign corporations." In addition, "It shall be unlawful for any person to solicit or receive any contribution from any of the persons or entities enumerated herein," the Code said. Sec. 81 of the Code also states,"It shall be unlawful for any foreigner, whether judicial or natural person, to aid any candidate or political party, directly or indirectly, or take part in or influence in any manner any election, or to contribute or make any expenditure in connection with any election campaign or partisan political activity."